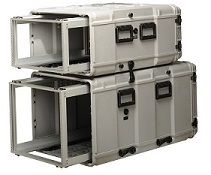 A comprehensive family of rackmount and transit cases. Utilizing fiberglass reinforced composites & rotomold for outstanding strength, versatility, & high performance. Both off the shelf and full custom designs available. Specializing in all aspects of military and commercial packaging. Including corrugated packaging, soft packs and specialty crates. Custom cushion design with reusable inserts. Military rugged and industrial grade computers and displays. Featuring tablets, PDA's, rack mount computers and displays. Custom solutions available. 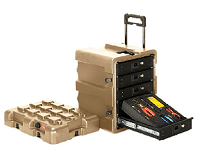 Intellipower is a privately held company that designs, manufactures, markets and supports high performance, cost effetive uninteruptible power systems (UPS) and power conversion products for rugged and hard indoor and outdoor enviorments. Global positioning solutions for distribution of GPS signals. Building block GPS products which include GOS antenna splitters, GPS amplifiers, and SPG re-radiating. High quality, cost effective master clock and precision time solutions, products include analog clocks, digital analog clocks, digital clocks, muti network displays and programmable bell ringers. I/O solutions for measurement and control applications. Embedded I/O and FPGA computing boards are available for VME, cPCI, PMC, PCI, FPGA & ISA. ﻿Leads the market in single board computers and I/O design, products that are used in military, aerospace, & homeland security applications. Industrial measurement and automation. Products for data acquisition, motion control, position acquisition and quality control. Full service computer systems integrator with expertise in real time hardware, software and systems development. Advanced RF receivers, multi-channel receiver systems, direction finding systems and antenna distribution systems for govenrment, military, security, survellance, broadcast monitoring, industrial applications. Receivers are available in PCI, ISA and stand alone versions. Electric Picture provides visual systems for simulation, control rooms and customer displays. Capabilities include; Design/Engineering, integration and support. Suppliers of RGB Spectrum, Samsun, Sharp Christie, Digital Projection, Panasonic, Extron, Planar, Da-lite, Kramer and many others. Would you like more information about product lines? Copyright 2009 Synergistic Technologies. All rights reserved.